AU Students Launch TurboVote Registration Initiative | American University Washington D.C.
Millennials, now equal to the Baby Boomers, comprise about 31 percent of the voting-eligible population. Whether you support Hillary Clinton, Donald Trump, or a third-party candidate, partisan passions are running high this campaign season. Yet American University students agree on this basic principle: You should make your voice heard and vote. There’s a new initiative supported by the AU Student Government, with assistance from College Republicans and College Democrats, to register every voting-age AU student for the 2016 election. To achieve this goal, student leaders are using TurboVote, an online application designed to make voting easier. “It’s an initiative to remind everybody who is related to the AU community to register, and then also to make a plan to vote,” says Valeria Ojeda, campaign director of the AU TurboVote initiative and also the AUSG Kennedy Political Union director. The TurboVote application provides people with voter registration information, key dates, and help applying for an absentee ballot. It sends deadline reminders for each user, which can be quite helpful for harried college students balancing a busy schedule. 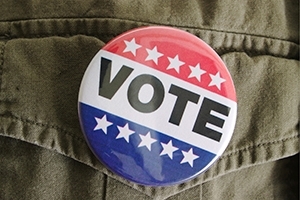 TurboVote offers students details about registering in D.C. or in their home state. That’s a critical feature for several reasons. Students who hail from swing states might prefer to vote there, as opposed to the District of Columbia (which is overwhelmingly Democratic and not competitive in presidential races). Also, students may want to cast a vote in U.S. House and Senate races, as well as state gubernatorial and local elections. Morgan Stahr, who is president of AU College Democrats and involved in the TurboVote effort, would rather cast a vote in her native Pennsylvania. Democrat Katie McGinty is trying to become the first woman ever to represent the Keystone State in the U.S. Senate. “It’s our first chance at a female senator. So, obviously, I want to make sure I vote for her,” Stahr says. While D.C. has same day voter registration, deadlines and rules in states vary considerably. TurboVote can guide students through an occasionally Byzantine process. Through the TurboVote registration campaign, AU organizers will target about 7,000 students—close to the number of undergraduates here. Students can apply to be AU TurboVote Ambassadors, and they’ll be dispatched to various campus locations, throughout September, to encourage fellow students to register. Team organizers will also utilize social and online media platforms to promote the TurboVote campaign. The TurboVote organizers emphasize the need to make this process nonpartisan. After an early conference call with TurboVote, Stahr and others concluded that this initiative would appeal to students of all political persuasions. “We thought it would be better to do this as a group effort, because there’s not a lot of things that the AU Dems and AU College Republicans could collaborate on. There are only certain things that we can do together,” says Stahr. Students noted that there were some issues, such as college affordability and health care, that affect Millennials across the political divide. “We thought this would be a great opportunity to get as many people involved as possible,” she adds. This is the first presidential election that pretty much all Millennials—defined as people born between 1981-1998—will be of voting age. Pew Research Center reports that Millennials now match the Baby Boomers as the two largest generations in the U.S. electorate, with each comprising about 31 percent of the voting-eligible population. Yet with only 46 percent of eligible Millennials voting in 2012, college campus registration efforts will be imperative in 2016. Ojeda says they’ll likely conduct registration outreach to graduate students, faculty, staff, and possibly for AU students abroad. Although details are still to be worked out, organizers are hoping to get students to the polls on election day in D.C., Maryland, and Virginia, she says.